I’m supposed to be grading papers so I’ll make this quick and dirty! There’s a new documentary called Samsara by the creators of Baraka (1992) and Chronos (1985), Ron Fricke and Mark Magidson, and everyone must go see it. After hearing some murmurings of how awesome this film was, I sent a shout-out to some of my writer friends last weekend to ask if they wanted to go together. To my surprise, despite it being labeled a “nonverbal, guided meditation,” all of them were very enthusiastic to see it. The theatre was packed when we arrived, and we were lucky to even get seats. Filmed across 25 countries over 5 years (see the map of locations), Samsara begins with a Tibetan monastery (Thiksey Gompa) in Ladakh where monks are making a sand mandala. Without giving away too much of the experience, let me just say that this film took me to places that I will probably never see in person — and even if I did go there, I wouldn’t see it in such isolated and spectacular vantages as the film offers. 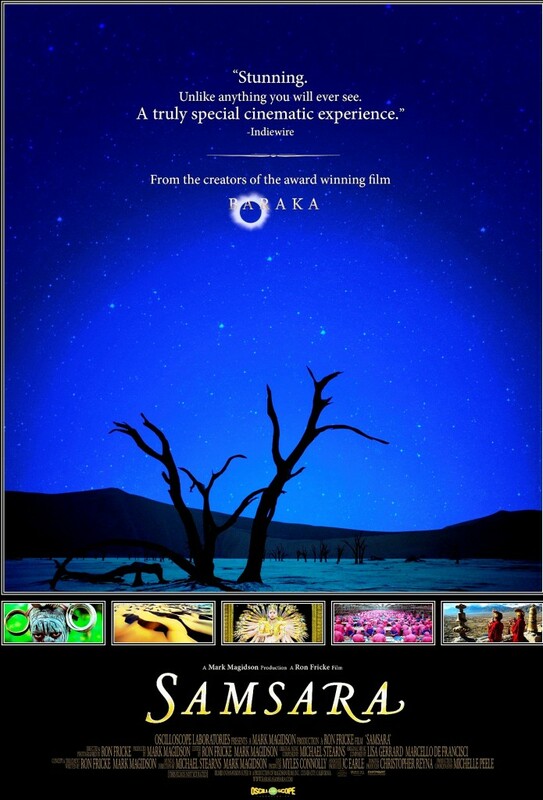 Samsara is a visual smorgasbord of the world. Destruction and birth, and the inherent beauty of this cycle are everywhere, so too are the disturbing sides of our humanity (ie. shots of mass slaughterhouses are juxtaposed with writhing Thai prostitutes in drag who gaze back at us as if to implicate us). The key moment in the film for me was when famed French performance artist Olivier de Sagazan performed his piece “Transfiguration.” It acted as a pivot in the film, coloring what followed with a certain danger: of seeing who we, as people, really are. You can watch a version of it here (warning: it is disturbing). This piece shook me to the core and while I couldn’t look away because I hated every moment of it, it also moved me because it captured each individual’s struggle to create, destroy and recreate him or herself. Damn it, when performance art is good, it is so good! At the end of the film, Samsara returns to Thiksey Monastery. After the insanity and smothering speed and crowdedness of the rest of the world, the gompa is a breath of fresh air. Every part of me wanted to shake off the grossness of this world and run there, renouncing all the distorted activities and thoughts that cause us to enslave each other and massacre animals to stuff ourselves with. 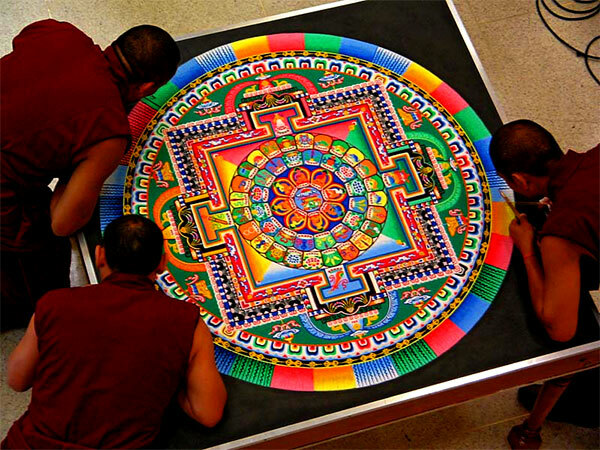 Anyway, the monks, having finished the mandala, stand over it and take a moment to gaze at their sand painting (from my crude understanding: mandalas are two dimensional representations of three dimensional places — some even represent the whole universe, says wikipedia). To learn more about mandalas, check out Cornell’s cool site on it. Then without any hesitation, the monks draw lines across the mandala and gather the sand in a bowl, turning their hard work literally to dust. Outside the film, my friends and I were left gutted by the film. We didn’t know what to feel, we were shell-shocked. “We’re fucked,” said one friend. “What was that?” said another. We all agreed that we liked it, that we were touched by it. But we couldn’t give it a clean narrative — five writers standing around in a circle with so little so say. Buddhism teaches that in every birth, there is death. In every meeting, parting. No film has captured this for me quite like Samsara, and it is especially wonderful to see the ancient wisdom and beauty of our heritage act as the axis to this brilliant piece of art. Go see it while you can still experience it on the Big Screen — it just won’t be the same on your laptop or TV. Here are the theatres showing it right now. And if you do, tell me what you thought of it! That’s all for now. This is NYCYak signing off. Ghale peh! ← How is a Truth Created in the First Place? Thx for the recommendation nycyak! Saw it because of this post, and loved it. Really makes you think – it was like a lesson in Buddhism without anything being said. Me too. Watched it after reading this.